A two side killer 7inch that you can pick up cheap. Both tracks are driving melodic punk rock of the finest sort! And a connection to Vibrators first 7inch We Wibrate with Chris Spedding: “When Chris Spedding moved to America at the end of 1978 he had a year’s contract to play with Robert Gordon. While in New York he began sitting in on rehearsals with a local band The Necessaries.”. AND to the Modern Lovers: “Ernie Brooks on bass. Brooks once in the Modern Lovers, but left when Jonathan Richman’s eccentricities became too demanding. “..his ideas of what the music should be changed so fast that it was impossible to keep up. At one point he decided that electricity was the work of the devil – that’s why he insisted on switching to acoustic guitars.” said Brooks.”. 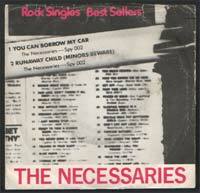 Read all about it here: The Necessaries Biograpy. Didn’t know about the Modern Lovers connection, that’s a good quote from Ernie. ha ha yeah :). Jonathan Ritchman and Brian Wilson in the same band would be a nice combination. Ops forgott Syd Barret(may he rest in peace) too. What an absolute belter! John Cale production I believe and the group also went on to feature Arthur Russell (maybe his name’s listed on this one too? ), the man whose odd disco productions from the 80s, downtown NYC, came back big time for the Rough Trade/ Other Music crowd. You can find it for like $9.00 at eBay. Pretty cheap I think. I’ll keep an eye out! “Event Horizon” and “Big Sky”. Although the Necessaries were an NYC band, neither album was released in the USA, they were only available as UK imports, and the album, without any promotion from the label or much interest from the band, made very little splash. Interestingly, with the recent revival of interest in Arthur Russell, few of the Russell biographies even mention his stint with the Necessaries! and the comment I posted there. Where is Randy now? I played drums with him. earnd a lot of money but didn´t understand nothing (or the clever way..). the capitalistic smile, humor me…..